Born 1958,Germany, piano and analogue synthesizer. 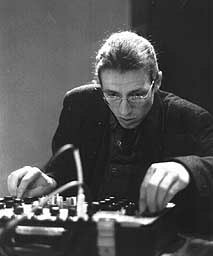 Since the early 1980s Thomas Lehn has been working as a performer, interpreter, composer and improviser of contemporary music. His individual style of musical expression is rooted in the experience of a broad spectrum of musical fields. After studying recording engineering at the Hochschule für Musik in Detmold (Germany), he moved to Cologne and received a formal education in order to become a professional pianist. From 1980 to 1987 he studied both classical and jazz piano at the Hochschule für Musik Köln. During the 1980s he was the pianist of numerous jazz formations and a member of workshop ensembles conducted by Gunter Hampel, George Russell and Keith Tippett. As an interpreting pianist he has played concerts since 1982 - performing both contemporary new music including numerous first performances and traditional composed music of the classical and romantically period. In 1989 he initiated the chamber ensemble Trio Dario and four years later the Mengano Quartett. Focused on performing compositions of the contemporary avant-garde, he is pianist of the Nova Ensemble Wuppertal, the ConGioco Ensemble and the quartet Natrium. He has also worked in performances of music theatre compositions of Maria de Alvear and Manos Tsangaris and in projects of performance artist Angie Hiesl. Based on his background as an interpreting and improvising pianist in the fields of classical, contemporary and jazz music, he developed his individual language in live-electronic music and this interest is pursued in parallel to his work as a pianist. The electronic equipment he uses consists of analogue synthesizers of the late 1960s. The facilities of these 'historic' instruments - e.g. to modify electronic sounds very directly as well as to combine and to control several parameters at the same time - allows him to spontaneously act and react in close contact with the process of tension, space and structure of the music during its performance. As a synthesizer player he has repeatedly collaborated with Martin Blume, John Butcher, Günter Christmann, Axel Dörner, Phil Durrant, Alexander Frangenheim, Wolfgang Fuchs, Mats Gustafsson, Gerry Hemingway, Tim Hodgkinson, Erhard Hirt, Paul Lovens, Paul Lytton, Radu Malfatti, Torsten Müller, Christian Munthe, Keith Rowe, John Russell, Hans Schneider, Burkhard Stangl, Martin Theurer and Roger Turner and others. 1994/1995,	Mangelware,	Hybrid HMP CD 10. Die Klangräumer. 1996,	Anomolies in the customs of the day,	Meniscus MNSCS004. One duo track with John Butcher. 1996/7,	Beinhaltung,	Fringes Records 03. Durrant/Lehn/Malfatti. 1997,	Linguafonie 3,	Linguafonie 3. Large-scale improvising group. 1997,	Tom & Gerry,	Erstwhile Records 004-2. Duo with Gerry Hemingway. 1997,	MIMEO/Queue,	Perdition plastics Per 009/GROB 005. 1997/1999,	Feldstärken,	Random Acoustics RA 027. Solo. 1998,	Zwei + zwei sind drei 2. Konzert,	Happy Few Records hf CD 3. 1998,	Temps durée,	Edition Explico 10. Christmann/Lehn duo. 1998,	Electric chair and table,	GROB 206/7. MIMEO. 1998/9,	Big deep,	GROB 102. Konk Pack. 1999,	Trinidad,	Happy Few Records HF8. Hirt/Theurer/Lehn. 1999,	(b)ypass (k)ill,	Plag Dich Nicht PDN 012. Shabotinski. 1999,	Live at the BIMhuis 1999,	The Field Recordings 9, FR9. e-rax. 1999,	C inside,	GROB 205. Chadlehn. 1999,	dach,	Erstwhile 014. Durrant/Lehn/Malfatti. 1999,	Excentriques,	Loewenhertz 006. Antasten. 1999/2000,	Echos an kegelrändern,	Loewenhertz 007. Antasten. 2000,	Bart,	Erstwhile Records 012. Duo with Marcus Schmickler. 2000,	Lingua,	Oaksmus om012010. Fuchs/Lehn/Spera. 2000,	Fire works,	Umbrella 028. Tom & Gerry. 2000,	Here there,	Fylkingen FYSP 1005. Lehn - Strid. vinyl 7". 2001,	Warp out,	GROB 323. Konk Pack. 2001,	Off leash,	GROB 654. Konk Pack. 2001?,	Ringtones,	Touch TONE 14. Snippet on 99 track CD. 2001,	The hands of Caravaggio,	Erstwhile 021. MIMEO/John Tilbury. 2001,	2001...,	November Music NM 005. One group track on compilation CD. 2001,	Songs,	between the lines btl 024. Gerry Hemingway. 2002,	Rabbit run,	Erstwhile Records 027. Rowe/Lehn/Schmickler. 2002?,	Thermal,	Unsounds U04. Moore/Lehn/Butcher. 2002,	AMPLIFY02: balance,	Erstwhile Records 033-040. Box set of 7CDs + 1DVD of Erstwhile-curated event in Tokyo. 2002,	Antics,	Institute for Improvisation INFIM. 001(DVD). E-rax. 2002,	November Music 2002: See the sound, hear the space,	November Music NM 006. One trio improvisation on compilation CD. 2003,	One,	SOFA 518. Toot. 2003,	Pica Pica,	ICP 041. Mary Oliver/Thomas Lehn/Han Bennink. 2003/2004,	HHHH,	Unsounds U10. The Cortet. 2003/2004/2006,	Obdo,	Another Timbre at07. Frédéric Blondy/Thomas Lehn. 2004,	Keith Rowe/Toshimaru Nakamura/Thomas Lehn/Marcus Schmickler,	Erstwhile Records Erstlive 002. 2004,	Triskaidekaphonia, Leo Records CD LR 461. Gratkowski/Lehn/Poore. 2005,	We were the phliks,	Rogueart ROG-0007. Scott Fields Ensemble. 2005/08,	Two,	Another timbre at14. Toot. 2006,	Futch,	Jazzwerkstatt JW010. Bauer/Rose/Lehn. 2006,	Vario-44,	Edition Explico 15. John Butcher/Roger Turner/John Russell/Thomas Lehn/Dorothea Schürch/Günter Christmann. 2006,	Lausanne,	For 4 Ears CD 2072. Leimgruber/Lehn. 2007,	Free electric supergroup,	Euphorium Records EUPH 018. Euphorium_freakestra. 2007/8,	The black hills,	GROB 962. Konk Pack. 2007/8,	Close up,	Monotype Records Mono 024. Bertrand Gauget/Franz Hautzinger/Thomas Lehn. 2008,	Doves days in Palermo,	Bowindorecordings BW09. Domenico Scianjno; one duo track with TL. 2008,	Backchats,	Creative Sources CS149. Speak Easy. 2008,	Speak Easy,	Panrec DVD. A film by Pavel Borodin. 2008,	Requiem for a baby grand,	Panrec PANDVD07/Heyermears Discorbie DVD 013. A film by Pavel Borodin with Hans W. Koch/Thomas Lehn/Ben Patterson/Jozef Cseres. 2008,	somethingtobesaid,	Weight of Wax WOW 02. AMM/John Butcher Group. 2008,	Artifact: live in St. Johann,	Okka Disk 12077. iTi. 2008/9,	Songs from Aipotu, Leo Records CD LR 599. Shift. 2009,	Unlimited 23,	Panrec PANDVD04P. A film by Pavel Borodin; includes performance by Speak Easy. 2010,	Horsky Park,	Another timbre at40. Tiziana Bertoncini/Thomas Lehn. 2011,	Almost even further,	Leo Records LR 644. 6ix. 2014,	Peter Jakober/ensemb]h[iatus,	Césareé 16/10/17/1.